HP's deal for EDS is a sign that companies sitting on a lot of cash are ready to put some of their money to work...and that's a good omen for the markets. NEW YORK (CNNMoney.com) -- What do you do if you have several billion dollars burning a hole in your pocket? If you're Hewlett-Packard, you go out and buy EDS for nearly $14 billion. Expect many more cash-rich companies to go shopping for deals in the coming months. HP's (HPQ, Fortune 500) acquisition of EDS (EDS, Fortune 500) is a bold strategic move for the company. 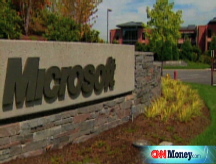 TalkBack: What should companies with billions in cash do with their money? HP has been playing catchup to IBM in the lucrative technology services market for years - former HP CEO Carly Fiorina tried to outflank IBM (IBM, Fortune 500) in 2000 with an offer to buy the consulting arm of PricewaterhouseCoopers. But Fiorina walked away from the $18 billion deal after coming to the realization that the price was too high...only to watch Big Blue scoop up PwC Consulting in 2002 for $3.5 billion. But more importantly for the overall markets, the HP deal demonstrates that companies with strong balance sheets - HP had nearly $10 billion in cash at the end of its most recent quarter - will be able to take advantage of the market's turmoil and snap up companies trading at steep discounts. Even with the premium HP is paying for EDS, the $25 per share price tag is still 17% lower than where EDS' stock was trading at about a year ago. With that in mind, I took a look for other companies that might be ready to make some big purchases. In addition to HP, many other large techs popped up on the list, including Google (GOOG, Fortune 500), Cisco Systems (CSCO, Fortune 500), Apple (AAPL, Fortune 500), Intel (INTC, Fortune 500), Oracle (ORCL, Fortune 500) and Microsoft (MSFT, Fortune 500) (which, as its attempt to buy Yahoo proves, clearly has the desire to spend big bucks). Google, Oracle and Cisco have all made notable acquisitions in the past few years and can clearly afford to do more deals. Intel and Apple have not been as acquisitive but - sooner or later - you'd think they would have to put some of that cash to work. Tech giants aren't the only companies hoarding cash - drug makers are too. Pfizer (PFE, Fortune 500) has nearly $30 billion in cash, Roche (RHHBY) has about $20 billion, and Wyeth (WYE, Fortune 500) and Novartis (NVS) each have more than $10 billion. Since many pharmaceutical companies have important drugs losing patent protection, it wouldn't be surprising if they went hunting for biotechs right now. In the oil patch, Exxon Mobil (XOM, Fortune 500), Royal Dutch Shell (RDS) and Chevron (CVX, Fortune 500) all have billions in cash that they could potentially use to buy alternative energy companies. Of course, many of these companies will use a lot of their cash for other things, such as reinvesting in their own businesses, paying dividends and buying back stock. But as cash levels rise, you'd have to think that at least part of it will be used for mergers. And just about every time we've had a merger boom, that's usually been accompanied by a nice move in stocks as investors furiously try and find the next big takeover targets. We've already seen this as shares of EDS competitors Computer Sciences (CSC, Fortune 500) and Bearingpoint (BE) both shot up late yesterday afternoon as news spread that HP and EDS were in takeover talks. And it's also worth noting that companies with big cash hoards aren't just able to use that cash to make savvy acquisitions, they also tend to be often viewed as proverbial safe havens during times of market tumult. Shares of the 43 companies that made it through my list are up, on average, about 1.3% over the past year. That may not seem like much...until you realize that the S&P 500 is down 7% during the same time frame. Issue #1 - America's Money: All this week at noon ET, CNN explains how the weakening economy affects you. Full coverage. Are you buried under a pile of debt and need help getting out? Did you recently manage to pull yourself out of debt and want to share your story? Tell us about your experience with debt and how the current credit crisis is affecting you.. Send us your photos and videos, or email us to share your story.